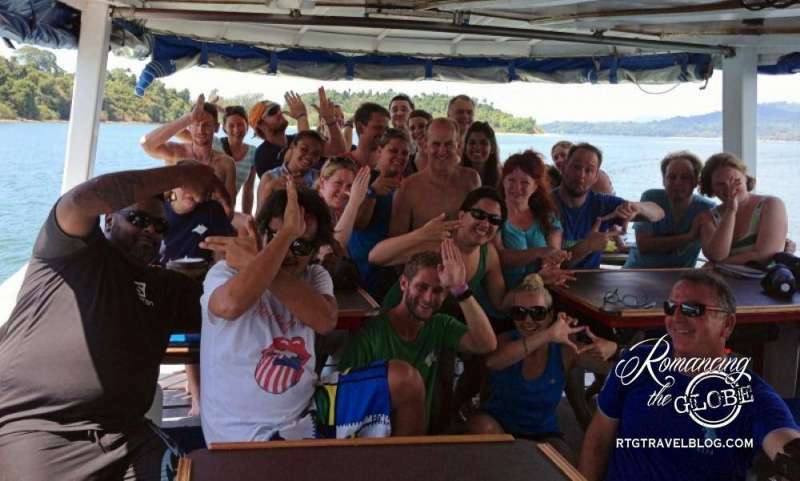 SCUBA Diving Thailand on a Live-Aboard – Truly Wicked! She said: I’d do this again in a heartbeat!! We love to scuba dive (especially Sheila, the mermaid). Thailand is famous for excellent diving so we looked for opportunities near Phuket. We found many live-aboard dive boat options with tours lasting from 2 days to 2 weeks. To fit into our available timeframe before our bareboat sailing trip, we reserved 2 spots with Wicked Diving aboard the MV Mariner for a 3 day, 3 night, 9 dive adventure in the Andaman Sea (Indian Ocean) 60 miles off the coast of Khao Lak among the Surin and Similan Islands. The price was only $550 per person including all diving, rental equipment, accommodations, and meals. This is serious diving for serious divers – all you do is dive, talk about diving, eat, and sleep for the duration. Prior to diving, we stayed at Bhandari Resort and Spa, a lovely property in Khao Lak. We chose 3 days to adjust to the halfway ‘round the world jet lag. The property is beautiful, spacious, quiet, and clean, a short walk to the beach or to town and includes a generous breakfast buffet. It was just what we needed to get started. It’s amazing how well the area has recovered from the Christmas 2004 tsunami. Learn more about Bhandari Resort and what other travelers have to say at TripAdvisor. The Wicked Diving shop is right there in town. They ask that you come in to complete paperwork, pay the National Park fees, and get sized for any rental equipment the day before the trip departs. No problem. On departure day, after a two hour massage at Casi Spa, we arrived at the dive shop at 4:30 PM to find 16 other enthusiastic strangers from around the world (Russia, Australia, Brazil, and most of Europe). We weren’t strangers for long. After a 90 minute van ride, we arrived at the harbor just before sunset. It took only about 10 minutes to unload the vans and board the awaiting MV Mariner. The Mariner is not high-speed, so it was a 5+ hour ride across rough seas to our overnight anchorage. During the ride we had dinner, an orientation, made friends, took quick showers, and got settled into our cabins. She says: These two lovebirds don’t do well in bunk beds for 3 nights! He says: Only three bathrooms for 30 people??!! But they kept them clean, and somehow, it was rarely an issue. The Mariner has tiny, tiny cabins with one tiny corner shelf, shared bathrooms, and low ceilings (the boat was definitely designed for people less than 6’ tall, so Tom had lots of head bumps) and YET the only mirrors were placed well above Sheila’s head, so she never saw herself for 3 days. There are 3 decks (not counting the engine space). The lower deck has the dive platform, the bathrooms, and most of the cabins. The main deck has the dining and socializing areas, a couple guest cabins and the captain’s bridge and quarters. The top deck has a shaded lounging area and a sundeck. It’s an awesome spot to relax, but unfortunately this is where smoking is allowed. Nobody wears shoes for the duration of the trip. In fact, you check your shoes at embarkation and don’t see them again until the end of the trip. A typical day – early wake up, eat, have a dive briefing, dive, rave about the dive, rest, eat, have a dive briefing, dive, talk about the dive, rest, eat, etc. Beer is available after all dives are completed but nobody drank very much – you don’t want to be the slightest bit hungover for the next morning’s dive. Each dive guide leads at most 4 divers. Our assigned dive guide, Helena from Switzerland, was fabulous, fun, and safety conscious (and very cute!!). 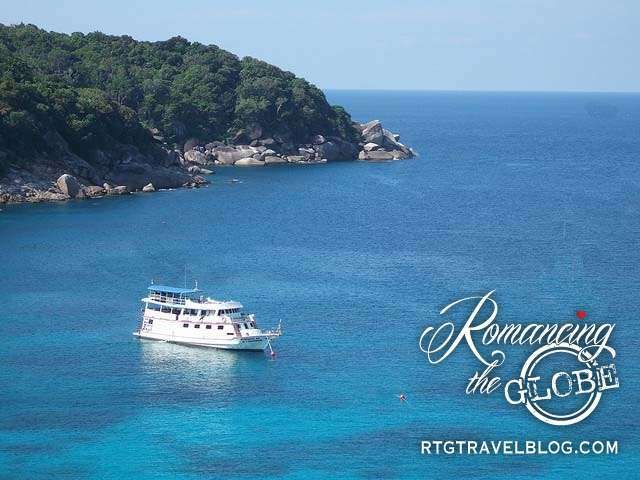 We visited sites with names like Torina Rock, Richelieu Rock, Tachai Pinnacle, and Boon Sung Wreck. A great variety of very colorful fish. Unfortunately, it seemed like the prettiest fish were also the fastest and most camera-shy. Fish are usually not very cooperative posers. Video seems to work better. Update: Now we have a GoPro and love it for diving! Big schools of fish – when there are so many, it’s much easier to capture them on film. Sea cucumbers come in many shapes, sizes, and colors. Unlike fish, they are very cooperative and pose quite nicely. As do anemonies, lobster, starfish, clams, and sea fans. Moray eels are also fairly easy to photograph, but it’s a little more scary to get a close-up. Fish in stealth mode! Can you find them? Click to enlarge. At the end of day two, we were scheduled for a night dive (Sheila’s first). The captain heard reports of whale shark and manta ray sightings in the area, so we voted and chose to move the dive earlier for more light. This site had gigantic schools of small bait fish and since sunset and sunrise are primary feeding times, they were very nervous and danced in amazing group shapes, very much like the murmurations of swallows in flight. Alas, no whale shark or manta ray sightings for us… and no night dive. Our last dive was the Boon Sung wreck. The visibility here was not as good as other sites, possibly due to more diving traffic, but the abundance of fish with the wreck as a backdrop made for an excellent dive. Swapping clothes doesn’t work well when diving! One scary mishap occurred when the dive staff accidentally switched our equipment. Each diver’s equipment was always set up in the same spot, but one morning they switched our BCD gear when they refilled our Nitrox tanks – with Tom wearing Sheila’s small BCD and Sheila wearing Tom’s large. In the dive departure rush, we didn’t realize the issue until we were in the water and we tried to make it work – BIG MISTAKE! This was our deepest dive of the week – close to 90 feet – and we both struggled with our misfitting equipment – souring an otherwise great dive. Sheila’s BCD had so much movement it constantly pulled the regulator from her mouth. Good thing she’s a mermaid and didn’t panic. Overall, Wicked Diving is a wicked awesome dive outfit!
? Please tell us your favorite places to dive! Our latest SCUBA story is from Tobago Cays. Next up is Australia’s Great Barrier Reef! Your recommendations?